For all the travel enthusiasts and those interested in sight-seeing, this promises to be a once in a lifetime experience. It starts with the culturally rich and colorful Karimabad Bazar. We will also visit the Altit Fort which is built on a sheer rock-cliff that falls 300 meters (1000 feet) into the Hunza River and the Baltit Fort, also known for its heritage and history. The view of mighty Attabad Lake a reminder that there can be beauty in tragedy. Along with that a mesmerising 360 degree view of 7 giant snow capped peaks (Ultar, Hooper, Rakaposhi, golden peak, Lady Finger etc) could also be enjoyed from the comfort of your cozy room at Eagles Nest hotel. Last but not the least the mighty Karakoram Highway will also be by your side till the end of the journey! People call it the 8th wonder of the world, those who haven’t sent it need to see it to believe it! —Start Date: Wednesday, 3rd MAY 2017 03:00 PM from LHR. —End Date:Monday , 8th MAY 2017 11:00 PM at LHR. -Departure at 03:00 PM from Lahore. -Dinner & Night Stay would be in Shangrilla Chilas. -Arrival at Hunza, sightseeing at Karimabad Bazar, Altit & Baltit Forts and Ganish Village. -Dinner/Night Stay in Hunza Eagle Nest. -Visit to Attabad Lake and visiting SOST before reaching Khunjerab pass and then returning. -Dinner and Night stay in Eagle Nest Hotel. – After Breakfast departure from Chillas/Besham, for Lahore. – Stop for dinner near Abbotabad/Mansehra. The much renowned Hunza valley is often referred to as heaven on earth, enveloped in the grand Himalayas and the Karakoram mountain ranges, this place has been a great tourist attraction for many years. Hunza is probably Pakistan’s most visited valley, by the tourists. It is a fairy tale land surrounded by beautiful rugged & snow capped mountains. Only at a distance of 100 Kms. from Gilgit Hunza is a small town on Karakorum Highway. At the altitude of 7000 – 800 feet it is the first main town or stop if you are entering Pakistan from China. 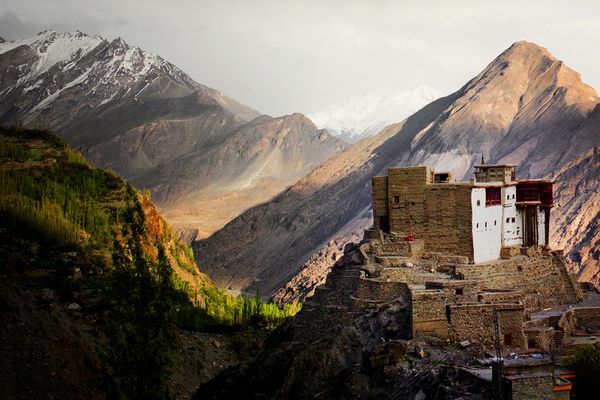 The central Hunza known as Karimabad is basically a town of just 6 villages. The first main villages as you come from Gilgit on the main Karakorum Highway is Aliabad. There there are spectacular views of Rakaposhi mountain (7788 meters), Just above Aliabad on the hill are Altit and Baltit villages the heart of Hunza. There is a very interesting Bazaar and two Forts in Altit & Baltit Villages. The Baltit fort has recently been restored and converted into a guided museum. Hunza is undoubtedly the most Photogenic point in the world. Passu: is a small village on the Karakoram Highway, beside the Hunza River, some 15 kilometres from Gulmit, the Tehsil headquarters of Gojal in the Gilgit-Baltistan region of Pakistan, and about 150 km upriver from Gilgit. It lies very near the tongue of the Passu Glacier, and just south of the tongue of the Batura Glacier. The latter is the fifth longest non-polar glacier in the world at 56 km, and reaches very near to the highway. The people are Wakhi and speak the Wakhi Language. Religiously they are Ismaili, a sect of Shia Islam. Tupopdan, 6,106 metres (20,033 ft), also known as “Passu Cones” or “Passu Cathedral”, lies to the north of the village; it is the most photographed peak of the region. Also nearby are the high peaks of Pasu Sar, Shispare Sar, and Batura. Sost: Sust or Sost is a village in Gojal, Gilgit–Baltistan, Pakistan. It is the last town inside Pakistan on the Karakoram Highway before the Chinese border. The town is an important place on the highway for all passenger and cargo transport because all traffic crossing the Pakistan-China border passes through this town; the Pakistani immigration and customsdepartments are based here. Pakistan and China have opened border for trade and tourism at Khunjerab. –Extras at hotels like hot / soft drinks, laundry, phone calls. –Insurance liability medical aid, and helicopter rescue coverage. –Any kind of expense incurred, if anyone leaves trip at any stage due to any reason. –Anything other than mentioned above in “Cost Include” area is not included in cost. -It is advised to carry only basic essentials/amenities on the trip. Items such as Drugs, Arms and Alcohol are strictly prohibited . In case of non compliance, the person responsible will be expelled from the trip without reimbursement. -Keep in mind that on adventure trips of this type, weather, local politics, transport or a multitude of other factors beyond the control of organizers can result in a change of itinerary. It is, however, very unlikely that the itinerary would be substantially altered; if alterations are necessary the Leader and Guide will decide what is the best alternative, taking into consideration the best interests of the whole group. -Use of violent behavior including altercation, insinuations of indecent kind, verbal and physical abuse and assault, aggravated behavior, or any other act amounting to unbecoming of member are strictly prohibited. -All members would give extra care for the local environmental care .Garbage (tins. Water bottles, wrappers etc) shall be suitably disposed without polluting water sources. -The host reserves the right to cancel trip without prior notice for any reasons deemed appropriate by them. In such a case the registered participants will receive full refund. For Reservations and queries, please feel free to contact below mentioned contact numbers.